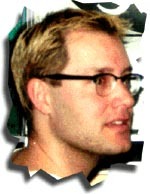 Todd Kuipers is a software designer/Internet consultant, living and breathing, with his wife Susanna, in Calgary, Alberta. He is resident at Merak Projects currently working on Web based implementations of their petroleum software. He spends his spare time reading, writing, reading and writing about beer, tasting beer, reviewing anything that he comes across and providing pure research skills to paying customers. Things Todd and Internet can be seen at http://propagandist.com/. One time proprietor of the currently defunct "E-mail-zines list", a listing of e-zines available via e-mail, Todd kept his interest in "low-bandwidth active delivery content" and currently subscribes to (and generally reads) 60+ e-mail publications on a wide variety of topics. A couple of daily mailers this time. Both of which unabashedly sport advertising in every daily issue. E-zine Description: Gagler's is a daily (7 days per week) joke mailing list (surprise!). The jokes are supplied to the list by the list subscribers. As of this review the jokelist reaches over 50,000 subscribers directly. Pretty simple here. Every issue has a joke (sometimes 2). As mentioned above the jokes are provided by the list subscribers and are usually worth at least a chuckle. Every day, sometimes a little late, but Gagler will make it up to you with extras and bonus jokes. Other than the jokes, the extras is where this list really shows its stuff. Subscription Info - not only does every issue present subscribe/unsubscribe instructions, but this one is personal. It mentions what e-mail address you subscribed with, allowing someone like me with 15+ e-mail addresses coming to one mail-box, to know which address I happened to use. It also provides the ability to forward your existing message to the unsubscribe system. Advertising - not obviously the best thing for readers, but the advertising lets Gagler provide at least a modicum of pocket liner as an incentive to get the jokes out on time. I personally wish that more e-mail-zines would provide advertising space, making them more viable in the long run. Web Site - packed fulla issue archives, FAQs, links and the obligatory disclaimer and copyright info. Excellent and fun list. you can usually read the joke in under 30 seconds, eyeball the ad (of course) and be doing other things without breaking a sweat. And of course the extras make (on the subscriber side) what should be a easy list to handle, easy to handle. E-zine Description: From the site: "Do you like a good challenge? Well have we got one for you! Our trivia-a-day service can email challenging trivia questions directly to you. Each question is hand-picked by our staff and is designed to give your intelligence a real test." Nice twist on the ?? ?-a-day lists. Trivia tends to be passed around at least as quickly a good joke and can sometimes help you sound as bright as someone with a new $10 word. Every issue has question, sometimes previewed in INDEX, that is answered using the best in trivia knowledge sources. Well presented and laid-out. Pretty straight-forward. Questions and answers; well written and put together in a concise manner. Daily, every day. 7 days per week. Rarely, an issue is missed, but is usually made-up for quickly. Every issue has proper subscribe and unsubscribe info, along with links to the site. Like in the Gagler list advertising figures prominently here as well, though the ads seem to currently be mostly self-promotion. Mailbits (http://www.mailbits.com/) puts out this daily mailer along with another four. You can subscribe to jokes, quotes, vocabulary and the "WebOwner" tips list, each mailed out daily in easy to digest bites. Like I said, a nice twist on the daily mailer concept. I quite enjoy the trivia, especially when one is surprising. Mailbits obviously (I think) sees a business model in e-mail that they're trying to capture a chunk of. With a large subscription base and their five flavour family these guys can offer an excellent advertising venue. Good luck to them. Text © Todd Kuipers, 1998, 1999. Part of the original Sideroad. The new Sideroad is now receiving traffic at www.sideroad.com.